The test of a well-planned kitchen is the amount of intelligent work that can be accomplished in it in the least possible time. Is the kitchen too large, therefore, necessitating much walking to and fro? Is it located near the pantry and storerooms? Where is the refrigerator, or, in case no ice is used, where is the cold storage for food? Is the sink of comfortable height? Are the cooking utensils arranged in the best possible position for use? Is the lighting good? Is it a cheerful room, or the most dingy in the household? These are a few of the questions that must be met when a really practicable kitchen is to be planned. Attractive surroundings have an inspiring effect upon any housekeeper and, in spite of her smothered longings and bravely unuttered desires,, the possessor of a dingy kitchen often longs for a prettier room and, when it is realized that the average woman spends fully a third of her time in the kitchen, it seems quite as reasonable to expend a little money for paint and furnishings for her workshop as for a new cement walk or fence, or attractive office fixtures for the man of the house. Since the wall serves as background for the room the finish should be unobtrusive. Whenever possible it will be found most satisfactory to paint the walls with a prepared oil paint rendering them washable with soap and water; they can be renewed every other year. For a dark kitchen with a northern exposure, a light buff is a cheery color, while, in a bright sunny room, a soft green will absorb the light and rest the eyes. The wainscot and mop-board may be painted in a slightly darker shade of the same color, while, if the chairs, table legs and wood about the sink are to be done, it is a good plan to use a darker shade as it is less liable to show soil. If it is necessary to paper the walls, choose a washable paper or one with a tiled design in blue and white; this gives a clean appearance, and, if the latter is coated with a white varnish, it can be washed as necessary and will last for several years. Another good plan is to put on an oilcloth wainscot - papering above it. The most sanitary finish for the ceiling is plain whitewash, because it can be renewed frequently, but, if the ceiling is in too bad condition to be left unpapered, the whitewash may be used over any light paper. The best finish for the kitchen floor is usually dictated by the condition of the floor itself. When it is old and seamed, there are but three solutions - first, a plain floor which must be scrubbed or mopped; second, an oiled floor; third, a good floor paint with a coat of hard varnish. If oil is to be used good results can be obtained from any standard preparation which costs about seventy-five cents a gallon. As these oils are usually made of crude paraffine with the wax fused into them they will present a hard surface rather than the sticky result obtained when boiled linseed oil is used. All things considered the best floor paint is the old-fashioned floor yellow, either prepared with the varnish in it, or with a coat of varnish applied after the coat is dry. A good grade of such paint costs about two dollars a gallon, but this amount will cover approximately four hundred square feet. Two coats should be applied. When there are children in the household, they will, of necessity, spend much of their time in the kitchen with the house-mother. In this case the floor should have a linoleum or cork covering to add to its warmth. If this is rubbed over occasionally with a little floor oil or wax, it will last much longer and will be more easily cleaned. Rag, cork or grass rugs should be placed before the sink and entry door. The question of convenient size for a kitchen is frequently raised, and whether or not it should be large or small depends on the type of family. However, the ideal kitchen is small and compact and should be used only for the preparation of the meals. A visit to a Pullman kitchen is an eye-opener in regard to compactness and efficiency. In a small, well-planned kitchen, every inch of wall space has literally its use and the time saved in preparing the meals in the small space is just as much as that which would be spent in walking about a too large room in quest of this or that. At the same time a limited working space necessitates constant clearing away, thus acting as a check upon any tendency to work in a muss and proving in the end a real time-saver. But everyone cannot have a kitchen which acts only as a workshop. If the house-mother has several children and does her own work, she will appreciate an ample kitchen, well-arranged, because it will be large enough to take in the children and their toys without having them underfoot. All the cooking apparatus should be together as in an invisibly divided room, while the sewing machine, the children's play box and a comfortable chair or two should be placed on a good-sized rug in another part of the room. Whether or not there should be a pantry is an open question which depends largely on the size of the kitchen. If the room is small, or if it is to act as the only sitting room of a maid, a well-planned pantry will prove a great convenience. The shelving should be open. A kitchen cabinet should be provided, if possible, but if it is not, a series of well-placed shelves should be put about fifteen inches apart above the cooking table, the lowest being wide enough to accommodate the mixing bowls and heavy utensils. The shelf above may be used for spices and flavorings, cereals and small quantities of meal, all of which may be stored in large glass jars. All of the receptacles should be labeled, the labels themselves being varnished on; measuring cups, spoons, egg-beaters, etc., may be hung from hooks along the shelves, or on the table ends. Both table and shelves should be zinc-covered, although oilcloth may be used. A shelf should be adjusted beneath the table, about fifteen inches from the floor, and, if a cleat is nailed around it, it may be used for kettles and other utensils. 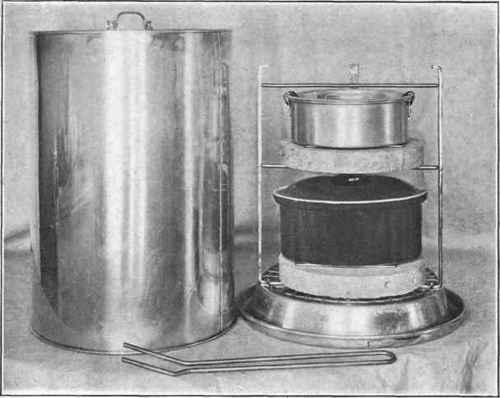 With this arrangement it will be possible to accomplish a large amount of cookery without leaving the table, except to go to the stove. This brings up the greatest disadvantage of doing the mixing in the pantry. The stove is, of necessity, in the kitchen, thus entailing many extra steps. 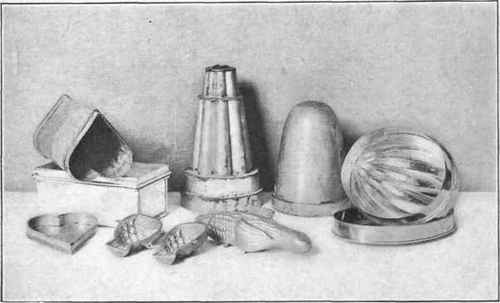 A Group of Ice-Cream Moulds. However, this can be partially overcome if an electric plate, or one-burner gas stove, is placed at the right-hand end of the cooking table. If this is done, salad dressing, custards, many a pudding, vegetable or soup can be cooking while other dishes are being prepared on the table. It will also be found most inconvenient to have the preparation table or a kitchen cabinet in the pantry unless the sink also is placed there. Both the cooking table and the sink should be made of convenient height for comfortable work without undue stooping, and a revolving stool that may be adjusted as desired, should be provided so that the housekeeper can sit during part of the work. If the table is too low, raise it by means of blocks of wood. If possible, a porcelain sink should be chosen. Needless to say, all the plumbing should be open and the utensils used in dish washing, together with some ammonia, a scouring soap, steel wool and a soapdish attached to the faucets should be grouped around the sink. If the sink cannot be adjusted to correct height, which varies with the woman, buy a galvanized iron pan or rack and set the dishpan upon it to raise it to correct height. If possible, drain boards or shelves should be on each side of the sink, but this is not always practicable. After scraping and stacking the dishes, they should be placed upon a shelf, or, in lieu of that, a wheel tray, at the right of the sink. The dishes should be washed and placed to drain on a dish dryer at the left of the sink. Frequently, the cooking table may be placed at the left of the sink, if there is no drain board. As far as possible all the cooking dishes should be washed up as fast as they accumulate, and, if a woman plans right, she will have very few pots and pans to wash after the meal is completed. If she is going to have company, she will certainly plan an oven or steamer-meal to avoid any last-minute cookery. Frequently, the cooking dishes, if there are only a few, can be quickly washed up before the meal is served. In clearing the table the dishes should, as far as possible, be stacked, the previous scraping, if done with a rubber dish scraper, being but the work of a few moments. The dishes should then be washed in the following order: Glass, silver, small china, large china dishes, then the cooking utensils, if there are any left. The range should be set as near as possible to the cooking table; again the question of correct height must be considered, for there is no better way to prevent backache than not to have it. In selecting any range, whether for wood, coal, or gas, choose one simple in design and easy to clean. Whatever the fuel 'used in the winter, either gas, electricity or kerosene should be used during the summer. Stoves of these types are not expensive, and the cost will be retrieved in the fuel saved during two summers' use. An adequate fireless cooker is of the greatest assistance, whatever the fuel. It is not necessary to buy the most expensive ice-box, but rather one of convenient size, large enough to contain a hundred pounds of ice and made narrow so that it will fit into any house. There should be few trimmings, - an ice-box does not belong in the parlor! The ideal refrigerator has a side compartment for ice - the cooling surface being greatly in excess of that where the ice is put in top. However, if the former is not available, the latter will be much better than none and should have side-doors, as this makes it possible for the iceman easily to fill the box. If the compartment opens at the top, he might drop the ice in and crack or bend the zinc lining. Several insulations are used, an air layer, mineral wool and charcoal being the most common. Charcoal is used in the better refrigerators and furnishes the most cold-tight insulation, because it is firmly packed in and cannot settle, as does the mineral wool. Any cracks in the lining should be repaired at once, lest the moisture work into the space. The air-space insulation is used only in the cheaper ice-boxes; whatever the material, it is not giving good service unless it keeps the refrigerator at an even temperature of forty degrees Fahrenheit, provided the ice compartment is kept filled and the doors tightly closed. Any refrigerator that contains moist-cold is inadequate, as moisture promotes bacterial growth. Try putting some matches in your refrigerator for a few days; if they will light on removal, the refrigerator is doing good service. The inner lining may be of zinc, enamel, porcelain or glass. Zinc is used in the cheaper grades, and, when it becomes black, may be covered with two coats of flat white and one of bathtub enamel; this is not only easier to clean but enables one to see the contents better. Glass and porcelain are both excellent linings, but the price may be prohibitive to the average person. The shelves should be adjustable, and of wire; no wood, not even under the ice-tray, should be used in the interior construction. The inner parts should furnish the smallest of lodging places for bacteria, as they will get in anyhow and can be controlled only by the even cold, which retards their growth. If possible, the refrigerator should have several compartments, as this is of great assistance in keeping the foods; butter, cream and milk, for instance, should be kept alone. Meats, and all other foods, should be covered, as they absorb odors. Then there is the question of the drain pipe. In many cases it has direct connection with a sewer and is a breeder of disease, as germs collect and grow. Better use the old-fashioned pan. And the question of ice. In the first place be sure it is pure for, if taken from contaminated waters, typhoid may develop. The ordinary snow ice, containing air bubbles which hold the germs, is especially to be avoided. Although, of course, ice is always washed before placing in the refrigerator, a piece of cheesecloth laid underneath will catch much of the sediment and aid in keeping the drain pipe clean. It is more economical to replenish with a large piece of ice rather than small ones, and it also keeps the box cooler. As it hinders radiation - the basis of refrigeration - the wrapping of ice should always be avoided. The range, the sink, the cooking table or kitchen cabinet, the stool and the ice-box, together with a suitable place for the receiving of soiled dishes furnish the backbone of the kitchen equipment. To this should be added a comfortable rocking chair, if the size of the room warrants it, and a commodious shelf for cook books, recipe files and a file of menu cards. A slate put in a conspicuous place should be adopted on which to chart out the day's menu, at least three meals in advance, and a calendar memorandum card will make short work of the notation of each day's supplies as they come in. It is an easy matter to make up the household accounts each week from this pad. A good spring scale is a necessity, a wheel tray is a great asset, one of the best types being in wood-colored finish with two trays; this can be folded if desired, and may be used in any room in the house, as a tray for the invalid, tea tray, or even for piazza refreshments. The best place for the dishes is in a small pantry or passageway between the kitchen and dining room. Needless to say these shelves should be closed in tightly. However, all the cooking dishes, bowls, earthenware, cooking glass, etc., should be grouped near the cooking table. No kitchen can be arranged according to set rule. But generally speaking the following order should be followed as closely as possible: Both sink and stove should be near windows. A shelf or table for stacking soiled dishes should be at the right of the sink and a shelf, or drain board, at the left. If the room is very small and must act as the laundry as well, the preparation table or kitchen cabinet may be dispensed with and set-tubs, with white enamel tops, may replace it. A group of shelves should be placed above the tubs, so that the cooking materials may be properly grouped. The ice-box belongs at the left of this cooking table. The china shelves should be as near the sink as is convenient. A zinc-covered shelf, or lightweight zinc-covered, or porcelain topped table should be placed beside the stove. If there is not room for this, the wheel tray can be called into requisition. The correct placing of the utensils is a point that deserves emphasis. The knives belong where the paring is to be done and may be slipped into leather pockets on the wall. The chopping knife belongs near the chopping bowl, the cooking spoons at the place where they will be needed and not in some obscure drawer. The frying pans belong near the stove and should be hung at correct height, not stowed away in some cupboard just because there happens to be one. In other words, common sense must assist in arranging the kitchen and grouping the utensils.